Wheaton College injunction: The Supreme Court just sneakily reversed itself on Hobby Lobby. While you were sleeping, Hobby Lobby just got so much worse. 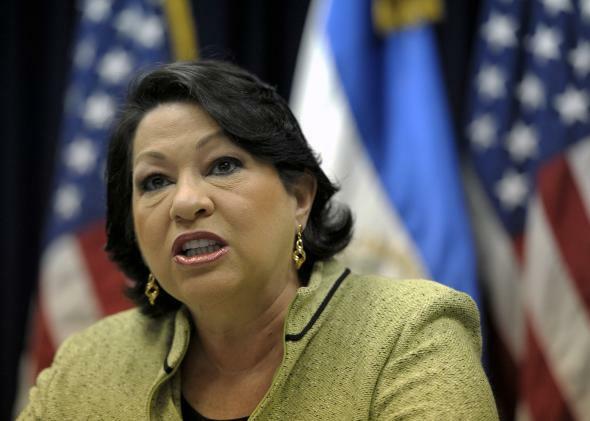 In a dissent, Justice Sonia Sotomayor has accused the court of going back on its word. The architecture of the U.S. Supreme Court Building is rife with turtles. There are turtles holding up the lampposts in the courtyard and turtles engraved in the stone decor. You can buy turtle coffee mugs at the gift shop. The turtle is said to represent the slow and deliberate pace of justice. This is an institution, the turtle tells us, that moves slowly, deliberately, and removed from the knee-jerk pace of the political branches. Yet moments before they adjourned for their summer recess, the justices proved they can act quite quickly and recklessly when it comes to violating the terms of a controversial opinion they handed down only days earlier. It’s as if the loaner car the court gave us in the Hobby Lobby ruling broke down mere blocks from the shop. In Burwell v. Hobby Lobby, the Supreme Court ruled that it was a “substantial burden” on the religious freedoms of closely-held corporations for the government to require them to provide contraception as part of their employee health care plans. The court didn’t say that the government could never require a company to do something that violated its religious beliefs, but rather that the government had to use the “least restrictive alternative.” That means that if there is a slightly less burdensome way to implement the law, it needs to be used. To prove that the Affordable Care Act’s contraceptive mandate was not the “least restrictive alternative,” the court pointed to a workaround in the law for nonprofits: If there are religious objections to a medical treatment, third parties will provide coverage to the employees. Yet in an unsigned emergency order granted Thursday evening, the very same court said that this very same workaround it had just praised was also unconstitutional, that this workaround also burdened the religious freedom of religious employers. Overnight, the cure has become the disease. Having explicitly promised that Hobby Lobby would go no further than Hobby Lobby, the court went back on its word, then skipped town for the summer. Wheaton, however, along with many other religious not-for-profits, have long objected to this very workaround. They filed lawsuits claiming that the mere fact of signing a form noting their religious objection to contraception coverage triggered third parties to provide the contraception, which triggered women to have access to morning-after pills and IUDs, which in their view were akin to abortions, and thus violated their religious consciences. Signing the form, they said, was the same as actually providing the contraceptives themselves. It’s the butterfly effect of contraception. Any time Wheaton flaps its religious-conscience wings, a woman somewhere ends up with an IUD, and Wheaton’s religious liberties are violated. And Thursday night a majority of the court agreed. The order is a preliminary injunction. The court will need to decide this and dozens of similar cases in the future. The justices caution that this in no way reflects their views of the future cases. But for our purposes, let it be known that the very workaround the court gave to religious objectors only four days earlier now likely violates their religious liberty as well. The dissenters take issue with several aspects of the majority’s act. First is the professed scope of the Hobby Lobby decision. Try to remember all the way back to Monday, when, writing for the majority, Justice Alito folded up the decision into something he characterized as nearly trivial. Look, it practically fits into his pocket! The decision only applied to family-owned, closely-held corporations, he assured us. The ruling was not going to unsettle a thing. “Our decision in these cases is concerned solely with the contraceptive mandate,” he soothed. Nothing about the holding would undermine an employer’s responsibility to provide vaccines to his employees, or to abide by existing employment and antidiscrimination laws. “Our decision should not be understood to hold that an insurance-coverage mandate must necessarily fall if it conflicts with an employer’s religious beliefs,” he wrote. But nowhere in his opinion did Alito tell us how or why there would be no such fallout. It was an assertion; or, in light of what happened next, a nice little act of judicial three-card monte. Justice Anthony Kennedy, in his own concurrence to Hobby Lobby, cautioned us not to read too much into the precedent that he had just helped set, insisting that the majority opinion “does not have the breadth and sweep ascribed to it by the respectful and powerful dissent.” But Justice Ruth Bader Ginsburg, as she is so often reminded, was not born yesterday. In her Hobby Lobby dissent, she disputed the narrowness of the rule and charged that the court had just waded into a “minefield.” She was right. The second problem with the court’s emergency injunction in the Wheaton case is about the viability of this workaround. You would be forgiven for having been misled. In his majority opinion in Hobby Lobby, applying the test required under the Religious Freedom Restoration Act, Alito determined that the problem with the contraception mandate was that it was not the “least restrictive” means for the government to achieve its goals of allowing women access to contraceptive care. What the majority said in Hobby Lobby was: Given that the administration had already nipped in the mandate a little for religiously-affiliated schools, hospitals, and charities, it was clearly able to nip it the same way for the for-profits who raise the same objections. “HHS itself has demonstrated that it has at its disposal an approach that is less restrictive than requiring employers to fund contraceptive methods that violate their religious beliefs,” Alito wrote. “HHS has already established an accommodation for nonprofit organizations with religious objections.” In other words, since the government had already created a legal workaround—the form that affirms the objection—that workaround was the narrowest way to achieve the government goals. If the Little Sisters of the Poor could sign a form that kicked responsibility for insuring contraception to the third-party administrator, Hobby Lobby should be allowed to sign the form as well. Although the opinion nowhere guaranteed that this compromise was not also going to prove to be a religious burden, Alito said it “achieves all of the government’s aims while providing greater respect for religious liberty.” Again, you would be forgiven for reading that to mean, as we briefly did, that the form implicitly did not burden religious liberty, even though the court did not directly decide the question. Or for expecting that the array of challenges pending in the lower courts (122 at last count) by nonprofits claiming that signing the opt-out form violates their religious liberty, might now be resolved in favor of the government. Days later, the respect it afforded religious liberty is not enough. The new unsigned opinion in Wheaton suggests that the fix to Monday’s problem—signing a form—is now a religious burden. At this rate, by next Tuesday the court will have decided that religious objectors can more readily opt out by way of a Bat Signal to HHS. Which said workaround, in turn, will soon be found to offend religious freedom. Not everyone was fooled by the majority’s promise that the decision in Hobby Lobby was narrow. But the speed with which the court has loosened the dam on this is stunning. While the court has told us that we are not allowed to question the sincerity of corporations’ professed religious beliefs, we remain free to question the sincerity of the court’s pinky promise that the Hobby Lobby decision would have a limited scope. At the end of this term, many people sighed a breath of relief that the outcome of Hobby Lobby was not as bad as we’d feared. It will be. The only thing turtlelike about the court’s behavior in Hobby Lobby was that an impenetrable shell protects it from the consequences of what it has just done.